On this Labor Day, I am so grateful to my union, SAG-AFTRA for giving me a steady income of residual checks during a year in which I worked very little, a year of wonder with my now one year old daughter. I am grateful to my employers, many of whom I am lucky to also call friends, friends who have patiently waited for me to say I can return to the voiceover, acting and singing jobs I love. I am grateful to my husband, David, for his hard work at his job as well, which also made it possible for me to focus on taking care of our daughter this past year. Thanks to my union, I can work jobs that pay extremely well for just a day of work, and then continue to receive residual checks for a long time. Only union jobs provide this sort of income (residuals and royalties) to artists who may otherwise not be able to make a living doing what they love. Because it is Labor Day, and because I am now returning to work jobs in the city (without my baby, as much as she enjoyed her last visits to the recording studio) I wanted to post this thank you on Labor Day to the people who work so hard to give me a fulfilling and creative work life that I love: THANK YOU to my husband, to my employers, and to my union. THIS is why I love voice acting! So, to all my fellow actors, singers, and voice actors out there: Even after a great audition reading, monologue or song, you should always offer something more if you have something truly different and equally great, because if the casting director is willing to hear it, you could find yourself up for more than one role and get to wow them twice! Fellow actors, and people in the industry should watch this beautiful video of Maysoon Zayid… actually everyone should watch it. At first, I just scanned the transcript, but pretty soon I was reading it all, and then I found time to go back and watch the whole thing. It is 14 minutes long but worth every single minute. I’m a big fan of TED talks, and this one definitely spoke to me as a multi-cultural performer and woman. “With grace and wit, the Arab-American comedian takes us on a whistle-stop tour of her adventures as an actress, stand-up comic, philanthropist and advocate for the disabled.” She’s funny, inspiring, and I was just so impressed by her that I had to share. Here is Maysoon’s website if you want to read more about her! I recently booked and recorded a bilingual (English/Spanish) voiceover job from home thanks to a referral from fabulous fellow “Voxy Lady” Lisa Biggs. Being a new mother, I’m now submitting more voiceover auditions from home so that I can enjoy being with my baby girl as much as possible. Most of my voiceover work has taken place in various recording studios throughout New York (and elsewhere), so I’m still learning how to best pursue, book, record, and deliver voiceover jobs from home. As a SAGAFTRA actor, I thought there would not be many opportunities for me to work from home since union voiceover jobs tend to record in the city, but I have heard several top agents say that they are now requesting that all of their talent be able to record and deliver quality files from home, even if only for auditions. With all the advances and ease of new technology and equipment, recording from home is becoming quite common for professional union jobs! For any other voiceover moms out there, another “Voxy Lady” and work-from-home voiceover talent, Heather Costa, has some good tips on how to “fit everything in” as a working mom in this great blog post. Congratulations to voice actor, Rachel Fulginiti! Carnival time is here and the king cake Rachel won from the Voxy Ladies is being shipped to her from New Orleans! If you are reading this and saying to yourself, “Yummy!”, there are two things I suggest you do… one: order a king cake from Haydel’s Bakery for a taste of Mardi Gras, and two: make a donation next year to the Voxy Ladies 12 Days of Voxmas for a great cause and a chance to win! I’m featured in this blog post on The Girl’s Guide To Voiceover so I just HAD to share! It’s for a GREAT cause: The Children’s Holiday Magic Project. Many thanks to the Voxy Ladies for organizing this. I am very proud to be a part of such a worthy cause. 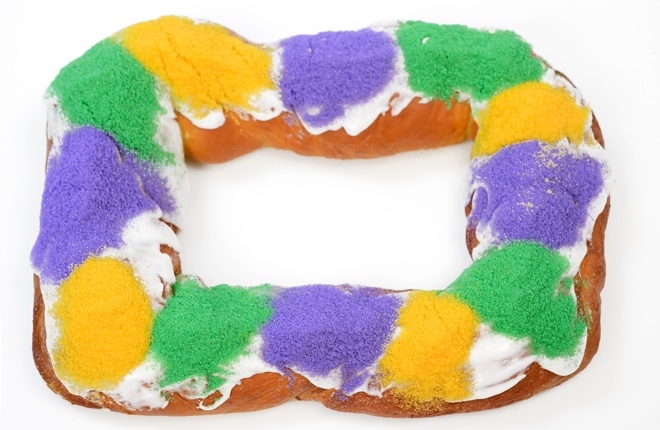 I am contributing a delicious King Cake Package from my hometown New Orleans! Tis the season for giving! 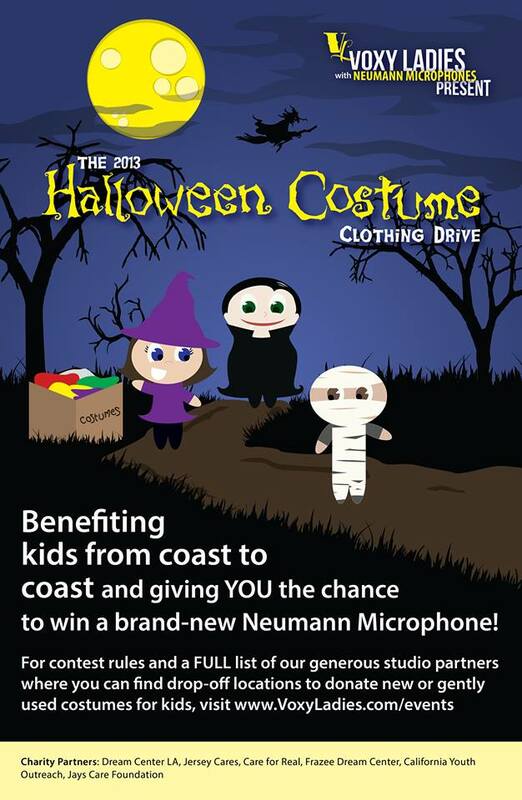 Donate a Halloween Costume & win a microphone! It’s that time of year again: the annual Halloween Costume Clothing Drive! As a Voxy Lady, I couldn’t be prouder to be a part of this wonderful clothing drive, benefiting children throughout the US and Canada. And if the feel-good feeling and good karma of doing a good deed isn’t enough, visit www.voxyladies.com/events for all the info & the scoop on how to enter to win a brand new NEUMANN MICROPHONE when you make a donation! Many thanks to Sennheiser USA! 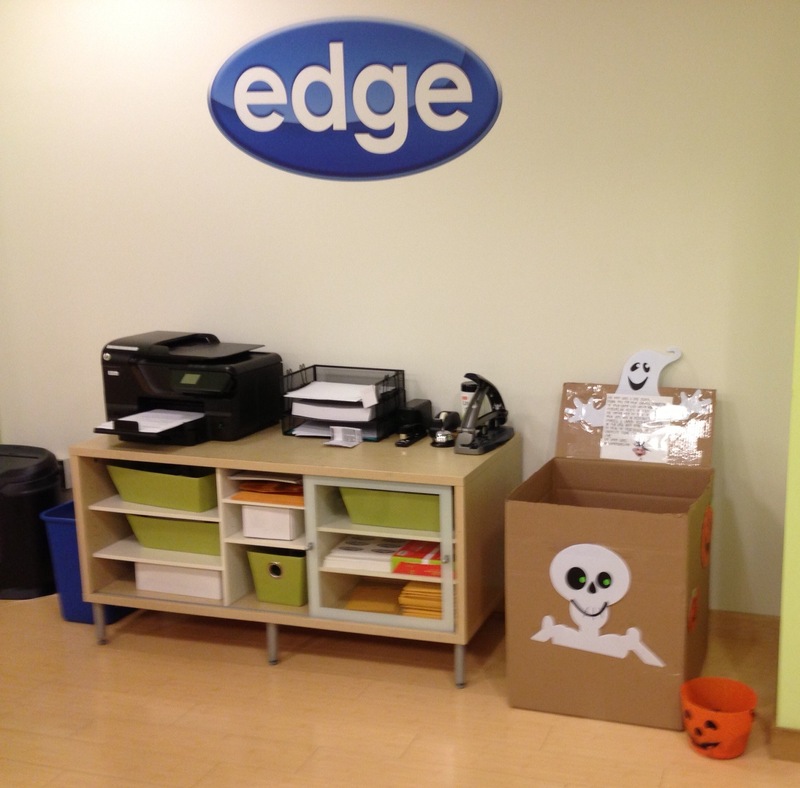 There are drop off locations throughout the US and Canada, however, I am partial to the donation box I created for the Edge Studio in NYC. They have graciously offered to partner with us for this worthy cause, so if you’re a New York actor or voiceover artist familiar with the Edge Studio, please donate there! (115 W. 45th St, between 6th & 7th) All New York donations are going to Jersey Cares. is a professional voiceover artist, actor, singer, director and teacher. Thank you to everyone who has been and continues to be supportive of me and my work in the arts. Muchísimas gracias a todos. Not following me yet? Here's what you're missing... I tweet about my work in the recording studio and on set, about classes and workshops with casting directors and agents, and great tips I've learned on the job, in class, and by way of teaching others. I tweet about theater, film, television, industry related news and events, marketing yourself, and the business of show business. I also tweet things that personally inspire me, motivate me, and make me laugh!